The call rang out across the great hall, ending all conversation. Members of the High Council, dispersing to their own factions, stopped their myriad conversations and turned to look at the source of the sudden, piercing exclamation. Chancellor Martok turned as well, from where he had nearly ascended the dais to take his seat. The source of the shout was a young, strong warrior. He stood in the doorway of the Council chambers, hand on his mek'leth, shaking with rage. From the moment this warrior rose to a position of power, Martok had known he would be...trouble. And now, it seemed, that day had come. The warrior known as J'mpok strode forward, towards the dais, murderous intent in his eyes. Like he had with every challenger before, Chancellor Martok rose to meet him. General Martok stood in an empty council chamber, remembering the surprise and pain as J’mpok’s mek'leth had slid into his skin all those years ago. It had been smooth, a clean cut. A good kill. Honorable. Decades later, the pain in his side had never quite gone away. Those Son'a toDSaH had taken his death from him. They had healed every wound, save his eye. Their radiation had made him better than before. It had also turned back the hands of time in many ways. giving him the strength and speed of younger days. A warrior did not waste the gift of time, and he had spent his days in the prison honing his every muscle, sharpening his every instinct. And yet – his wound, now long gone, still ached. Dying was not a thing a warrior should have to remember. He knew the members of the High Council would think him strange for standing alone in this room, long after the meeting had ended. Let them think him a doddering old fool – those that underestimated him always paid the price. The shrewder among them may think he was carefully crafting his strategy. After all, was he not known for being one of the great tacticians of his generation? Just as long as none of them knew how long it took him, every time, to ready himself to speak with the warrior that killed him. He sucked a breath through his teeth, cursing himself for this foolishness. He then stepped from the Council chambers into the Great Hall, and placed his hand on the mek'leth, the one he had carried in battle since his youth, the weapon that made Tzenkethi call him the Butcher. From the dais at the peak of the Great Hall, J'mpok turned, and narrowed his eyes. Neither warrior spoke a word as they descended into the depths of Qo’noS. Torches in hand, they stepped down winding staircases, far below the habitable structure of the Klingon homeworld. After miles of twists and turns, the path opened into an ancient, dusty hall. This was a sacred place, where only the greatest Loresingers and the Chancellor himself were ever allowed. The walls alternated between piles of ancient scrolls, full of the wisdom of warriors long dead, and stone carvings depicting the great legends of Klingons past, all the way to Kahless. A younger Martok would have seen this place as so much dust. When he was Chancellor, he revered the history of the Klingon Empire, but he was always looking towards the present, the problems they faced now. He had believed he learned the solutions to those problems from his years in war, in honorable combat as a warrior born. He knew those lessons well; well enough that he had never needed reminding. Now, facing the present, he wished he had spent more time in these ancient halls when they were open to him. In his time in the Briar Patch, he had delved deep into the stories of his people's past. There were legends and tales that kept his spine straight when it seemed all hope had been lost. How long did he have access to the original versions of these as Chancellor, and how many times had he rejected the chance to study their wisdom? Such foolishness shamed Martok. They were near the end of the hall now, and J'mpok stopped in front of one of the oldest, largest carvings. In it, a brave warrior stood his ground, surrounded by endless bodies of dead Klingon warriors. He held aloft the Sword of Kahless, the last warrior standing against an impossible foe. Insectoid, monstrous warriors surged in from all sides, so thick they blotted out the sun. Just in front of this legendary warrior – Martok should know his name, but it was lost to him – a gigantic beast stood, piercing the warrior's chest with one long talon. “Do you know of this piece?” J'mpok asked. “Incredible how accurate it is, is it not? The techniques of the ancient carvers, to capture such strange creatures so distinctly, with the tools they had. It's masterful.” J'mpok placed a gentle finger on the carving of the warrior, almost caressing his face. Martok seethed. This was the reason J'mpok had insisted on having this conversation in the tunnels. Their argument this morning had been about the current Hur'q threat. 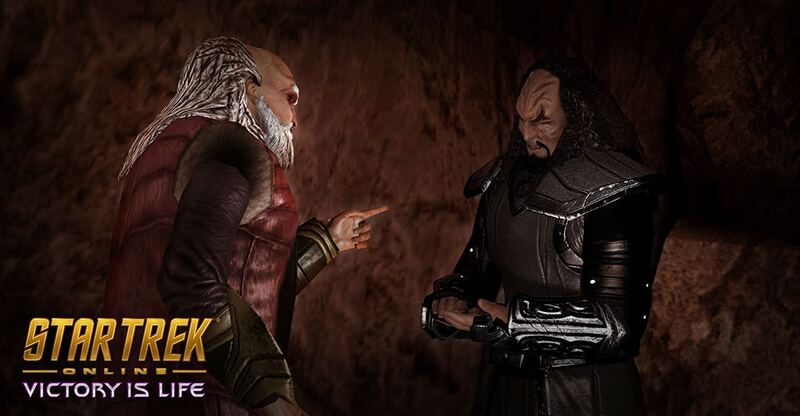 Beyond that, taking Martok to a sacred place – one that only J'mpok could give him permission to enter – it was a show of power stronger than his sword. Every Klingon instinct in Martok's very bones screamed at him to take up his mek’leth and risk the Hu'tegh consequences. He was not the man who had died on J’mpok’s blade when last they fought. He was stronger. Faster. Time had taken its toll on J’mpok, but fate had other plans for Martok. He could send J’mpok to Gre’thor where he belonged. He could take his place at the head of the Klingon Empire once again! The phantom wound in his side screamed in raw, red agony. He did nothing. The silence in the room was a memory. J'mpok had made a similar outburst decades ago. It had led to drawn weapons, to a battle for control of the Klingon Empire. The pain in Martok's side was a fire worse than that at the depths of Gre’thor. Two paths were spread before him. He could face this warrior in battle again, and risk his life, maybe accomplishing nothing. Or he could choose the path of his adopted brother, Worf, and try to talk. He grimaced. “Let me take a force. Lead our people into battle, to face this threat in honorable battle, to fight and, if necessary, die like warriors.” Martok knew he was pleading now. He did not care. The two warriors, the two Chancellors, faced each other in the flickering torchlight. The two men gave each other a nod of acknowledgement before walking out of the hall in silence. Nothing else needed to be said - for now. Each had heard a call to arms, and each would answer, as Klingons. Martok began the slow walk back to the light. There were warriors to gather.